Creole-born C.J. Chenier was raised in an indigenous American culture with its distinctive language, cuisine and music. He delivers soulful vocals along with masterful accordion-driven Zydeco and Blues. Chenier, a GRAMMY®-nominated, world-renowned musician and recording artist, has performed alongside many internationally recognized artists including his GRAMMY® awarded father, Clifton Chenier (“The King of Zydeco”), Paul Simon, Joe Sample and Ray Parker, Jr. He appeared on the Daily Show, CNN and was featured on VH1 and Entertainment Weekly. He has exhibited his musicianship at many large festivals and venues such as the New Orleans Jazz & Heritage Festival, Chicago Blues Festival and Austin’s SXSW Music Conference. In addition to his GRAMMY® award nomination in the Best Regional Roots Music Album category, C.J. 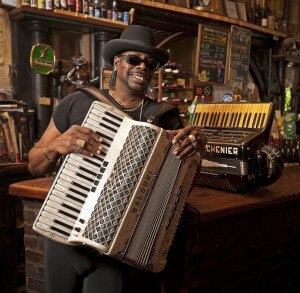 has received many major awards including the Living Blues Critics’ Poll Award, Indie Award (from AFIM) for Best Zydeco Album, Coups de Coeur (Blows of Heart), Blues Category Award from l'Académie Charles Cros (France) and Best of the Beat Best Zydeco Album (Offbeat Magazine). ​ CJ and the Red Hot Louisiana Band are a ready-made party with deep roots in Americana music. Dinner Seatings are at 6, 8 and 10pm. Reservations will be accepted after the New Year and are highly suggested. Dinner will be $55 per person and will include a scrumptious 4 course dinner of only our finest offerings and that will include the traditional King Cake- which determines our King and Queen of Mardi Gras! !